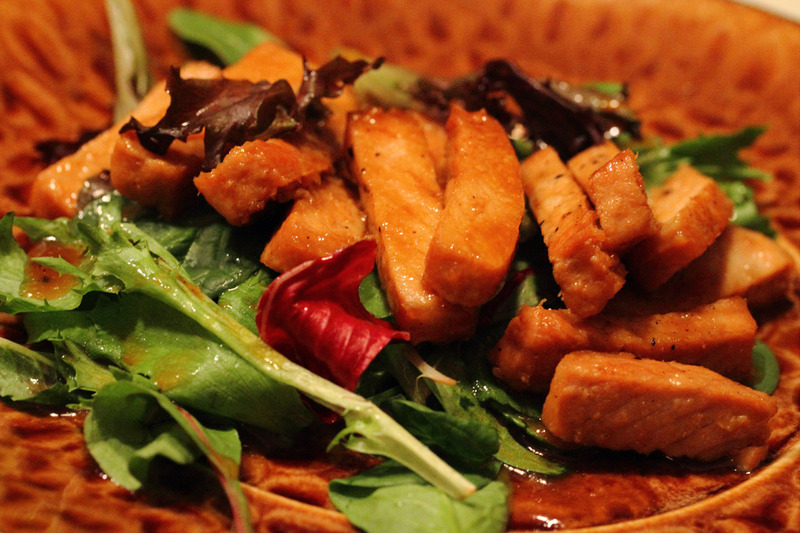 This recipe is a combination of two recipes, influenced by a local restaurant. The inspiration comes from Food Network chefs Anne Burrell and Ina Garten and Chatterley’s. I love Anne’s caramelization process and the herbs she uses. I love Ina’s use of cognac, sherry, white wine and the variation with beef stock. 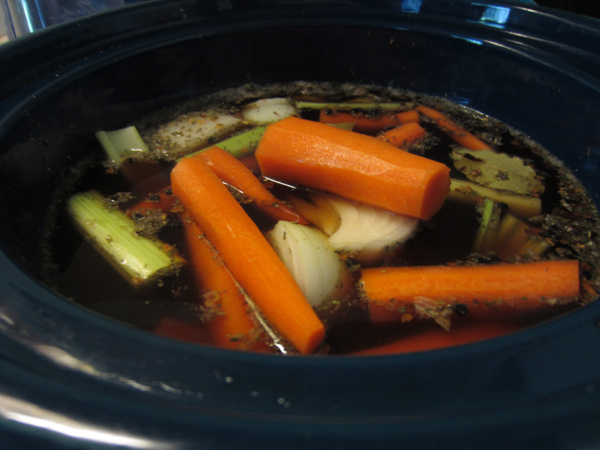 Anne’s recipe calls for chicken stock, which makes a soup that is lighter in color and flavor. Chatterley’s adds mushrooms. I actually think this recipe is very close to their French Onion Soup with Wild Mushrooms. This recipe makes 6 full servings. 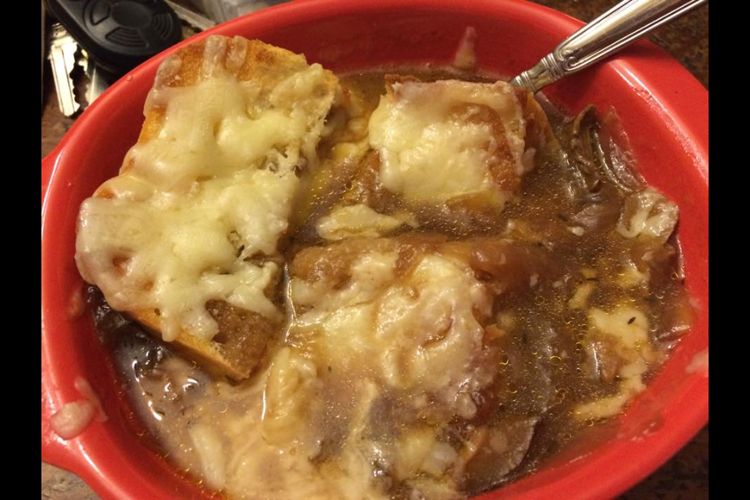 Onion soup crocks are small because they’re made to hold a pre-dinner serving of soup. So you will be able to fill 6 of those crocks twice. Feel free to cut the baguettes and cheese appropriately and save some for use in leftovers. Coat the bottom of a large heavy pot with olive oil (don’t use non-stick as it has a tendency not to develop the lovely brown stuff on the bottom). Add sliced onions and sprinkle with salt. Mix them up so that they’re coated with oil. Cover and sweat over medium to medium-high heat for 15 minutes until they reduce slightly and lose some of their liquid. 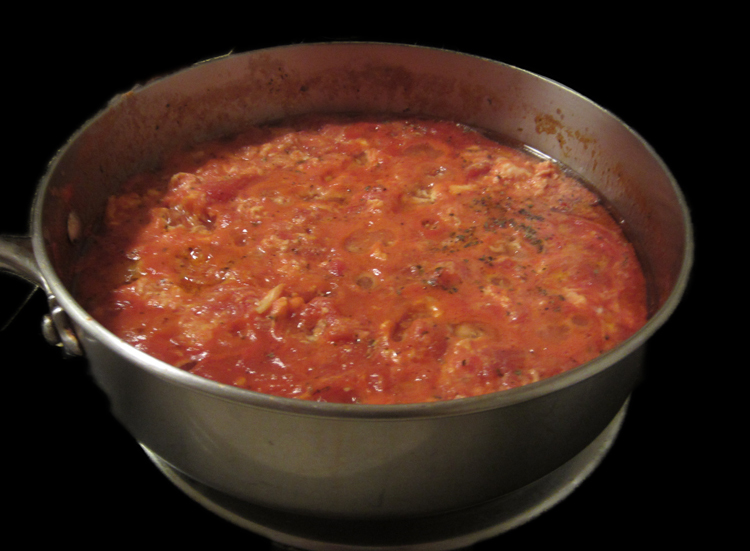 Remove cover and cook over low heat for a long time, an hour or more, stirring occasionally. As Anne Burrell says “This is a long process and it cannot be rushed. Accept it and move on.” Your house will smell lovely regardless. Slice and saute your mushrooms lightly in butter and set aside. Once the onions have gained that lovely brown color and are cooked down, add the sherry and cognac and scrape bottom to deglaze the pan. Cook until liquid is reduced by half. Add the mushrooms with their juices, thyme, bay and white wine. Simmer for 15 minutes. Add the stock, simmer slowly for 30 minutes or more, adjusting salt to taste. When you are happy with the consistency and taste of your soup, ladle the soup into bowls, top with a piece of baguette (or two if they’re small) and put a handful of Gruyere over the top of the bread and place under a broiler on low until cheese is melted and bubbly. This recipe is a favorite with family and friends. The recipe comes from a dear friend, who has been making it for years. Technically it isn’t a pie but it is baked in a pie dish. It’s more like an upside down cake but we don’t turn it upside down. We serve it with a spoon from the dish. Butter the bottom of an 8 inch pie pan. Peel and slice apples and place in pan. Sprinkle cinnamon and sugar mixture over apples. Cream softened butter and sugar, add egg and blend well. Add flour and salt. Spoon over apples. 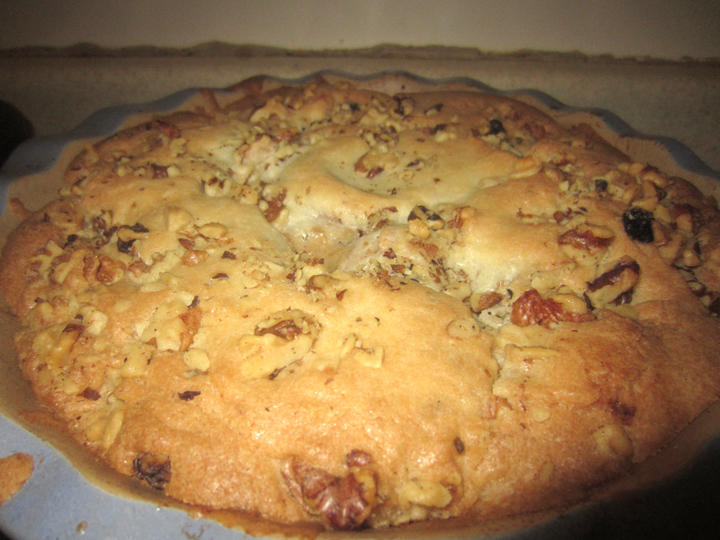 Sprinkle walnuts over the top and bake at 350 for 45 to 50 minutes. September usually brings an abundance of apples. It is this reason this pie came about! This went over with enthusiasm at my house. Apple and pork go wonderfully together, and with a bit of sage and cheddar, you have comfort food. Pork pot pie with a touch of apple sweetness. 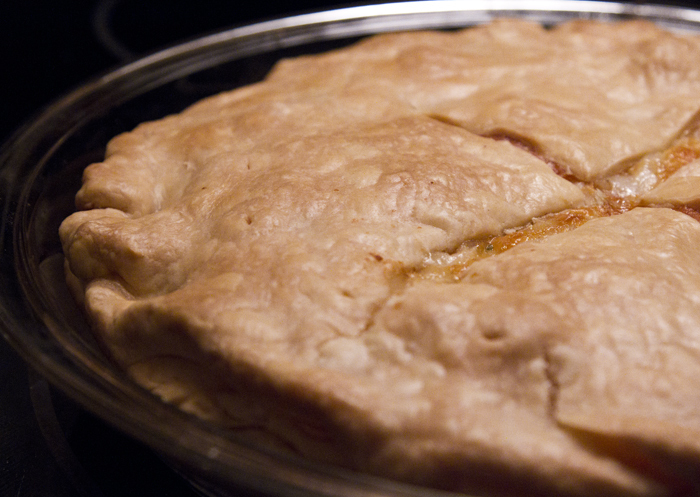 Make a hearty dinner pie on a chilly fall night! Brown pork in a saucepan over medium-high heat. Once browned, add salt, chopped onion and sage. Stir frequently. When onion is translucent, add water. 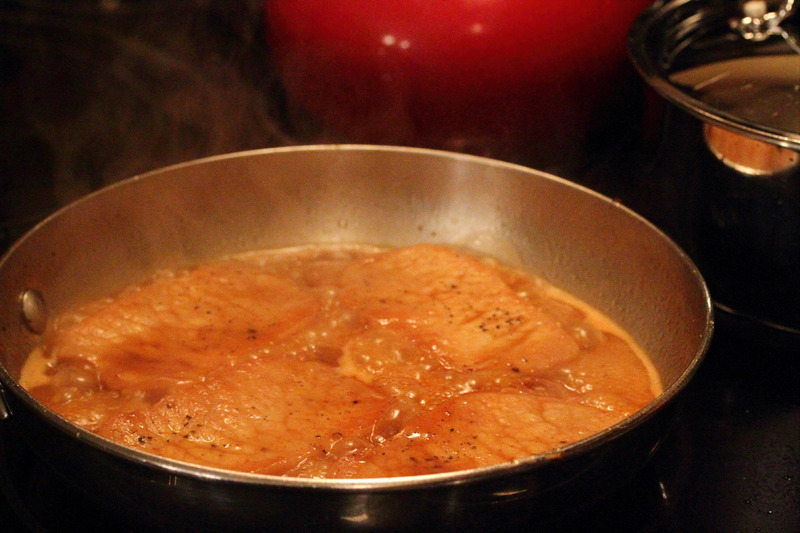 Cover and reduce heat to simmer for 20 minutes or up to 35 to 40 minutes if you want your pork to fall apart. Stir together the milk and flour until smooth and creamy looking. Slowly stir and add to the pork and bring to a boil while stirring. When the mixture is thick, it is ready for the pie. 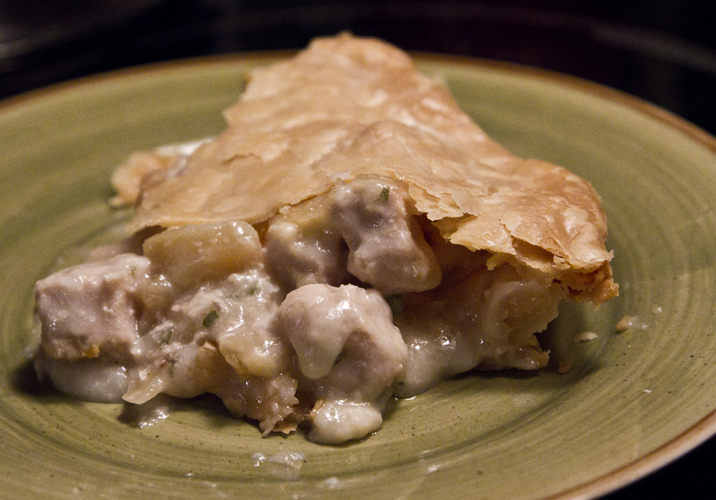 In a pie dish, over the prepared crust, add half the pork mixture. Layer the apples over the pork, sprinkle with sugar (optional), and then spread half of the cheese. Cover with the rest of the pork and sprinkle with the remainder of the cheese. 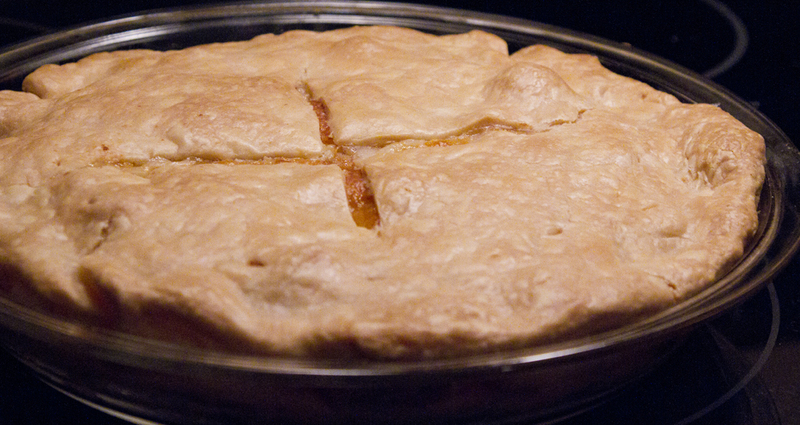 Top with another pie crust, sealing the edges, and slit the top, add some more small pokes around the perimeter. Place in the oven for 10 minutes, and then lower the temperature to 350. Bake for an additional 40 minutes, or until top is lightly browned. Let it stand to cool for 15 minutes before slicing. It’s almost that time of year, when Corned Beef is on everybody’s grocery list. We have a local grocery that brines their own and packs the spices for you to use when you cook it. There is, however, no reason anybody can’t put those spices together and make an incredible corned beef. I have quit using them and now just use these. Put the corned beef and all spices and vegetables except for the cabbage in a crock pot. Cook on low for 6 hours then add the cabbage. Cook an additional 2-3 hours. You can cook the cabbage separately, but don’t try putting it in at the beginning. It just doesn’t hold up. You can also cook this on high for 4 hours, adding the cabbage for only the last hour. If you have kids, you know how picky they can be. It’s not the prettiest of dishes, but it’s one that kids go nuts over. Some of us adults still eat it as a comfort food. I’m not sure how far back it goes in my family, but my grandma spoke of eating it as a kid. When I was a kid I thought this was the best lunch, snack or dinner in the world. Of course my mother and grandmother both made it with elbows, which carries the milk better than the egg noodles my daughter prefers, but it works with any kind of pasta you prefer. 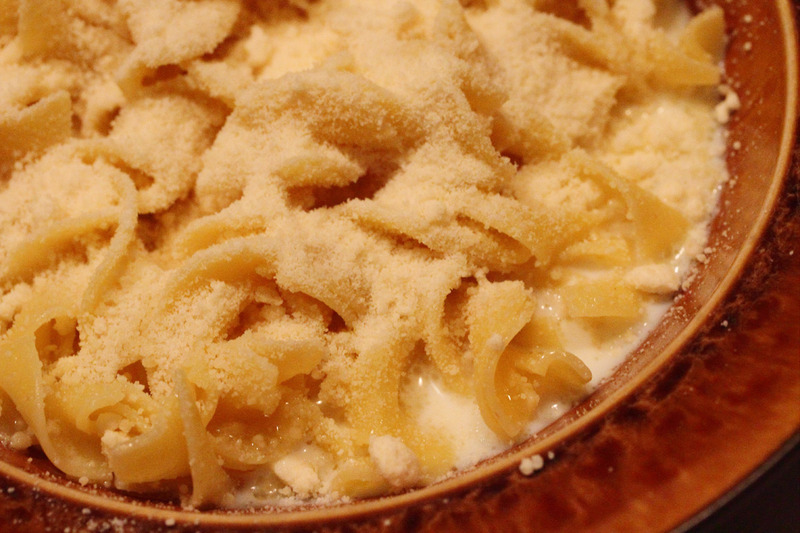 Let the kids sprinkle on dried parmesan cheese out of a jar (they usually really pour it on). Mom made this on Fridays when we were children because we couldn’t eat meat on Friday, and fish was a lot more expensive than pasta and a couple of eggs. She was born in 1930. Her Mom and Dad were both Italian, so she probably learned it from her Mom for the same reason, as money was probably a bit tight in the 30’s. 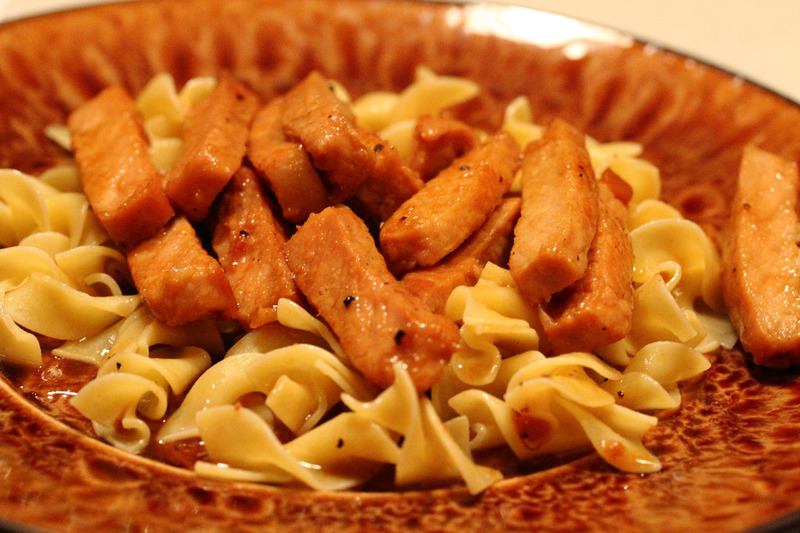 Egg is an inexpensive way to add protein to a pasta dish. This is a quick, delicious inexpensive way to whip up something quickly that will make everybody happy. This dish is so fast that I started it just before I started this post, and I’ll have to eat before I’m finished. So if you don’t have a lot of time, this is a winner. There are two things people fight over – tomato chunks and egg chunks, so be careful during the egg addition to make sure you get chunks. This is probably a four serving preparation if you have an iron will. It never makes it to four with us. Once your pasta water is heating, start your sauce. By the time your pasta is cooked the sauce will be done. On medium heat, cook garlic in olive oil in a large saute pan, don’t let it burn, just let it flavor the oil. Shake the pan to move the garlic around. Add the tomatoes. If you’re using whole tomatoes, break them up with your hands as you dump them into the pan. If you’re using diced, just pour them in. Add basil. Bring the sauce to a strong simmer. Stir and lower heat. Add the slightly beaten eggs by pouring them around the top of the sauce. Don’t stir a lot here. You want the eggs to start to scramble in the sauce. Every few minutes you can stir gently to move the scrambled eggs through. If you do stir them too much, the sauce will become more pink, but it’s still just as yummy. Leave it on a low simmer until your spaghetti is done. When your pasta water starts to boil, add the pasta. Cook to al dente. Drain pasta and add it to the sauce in the large saute pan. Toss to combine while still on the heat. It’s ready to serve. Top with your favorite Italian cheese. 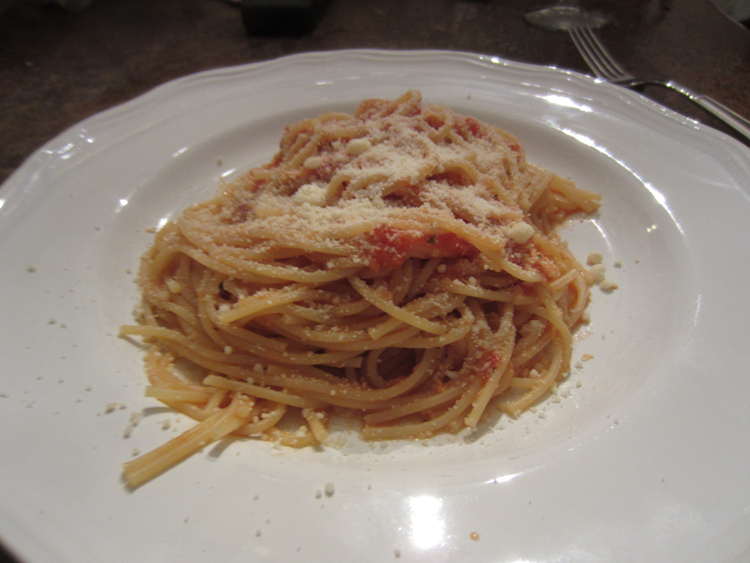 We used Parmesan growing up but it’s also good with Pecorino Romano.